Catering products belong to the group of perishable plastics. Disposable crockery and cutlery, as well as pots and bowls, pack foils for hamburgers and straws are being dumped after a single use, together with food-leftovers, forming huge amounts of waste, particularly at big events. The use of bioplastics offers significant advantages not only in an ecological sense but also in an economical sense. The costs for waste collection, recycling and land filling can be reduced considerably, as the catering products can be composted together with the food leftovers. Expensive waste separation methods are thus no longer necessary. 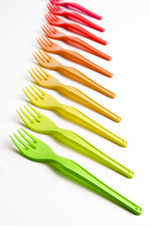 All catering products can already be manufactured from bioplastics. Manufacturers of bioplastic catering products can be as creative as if they would use conventional plastics: every color, size and form is possible.